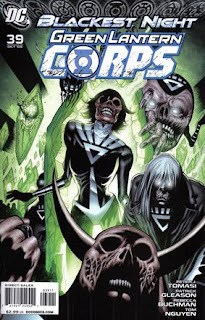 • PLOT SUMMARY: Blackest Night tie-in - "Fade to Black" Written by Peter J. Tomasi. Cover by Patrick Gleason & Christian Alamy. Pencils by Patrick Gleason, inks by Rebecca Buchman & Tom Nguyen. Just when things couldn't look any darker after the death and chaos of the Sciencell riot, Blackest Night descends on Oa! 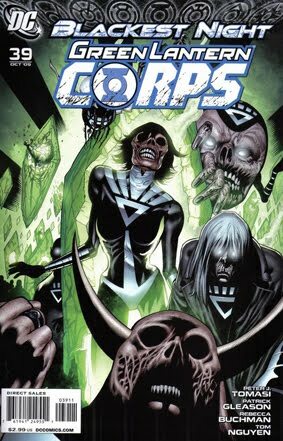 The black rings tear into the planet and the Lantern Crypt causing all the dead Corps members to rise and wreak havoc as a new and deadlier battle threatens to engulf not only the Corps, but the Universe itself!